Over the past few years, major productions have teamed with Omaze for incredible campaigns that bring fans closer to their favorite movies, while helping out some good causes at the same time. Most recently, Batman v Superman: Dawn of Justice teamed up with Omaze to give fans a chance to win a trip to last weekend's New York premiere, where the lucky winner got to hang out with Henry Cavill, Ben Affleck and Jesse Eisenberg. Today, Omaze announced that they are teaming up with Guardians of the Galaxy Vol. 2 star Chris Pratt, giving fans a chance to win a trip to the set in Atlanta. Omaze released a new video, where Chris Pratt explains this charitable initiative while giving fans a brief tour of the Guardians of the Galaxy 2 set. 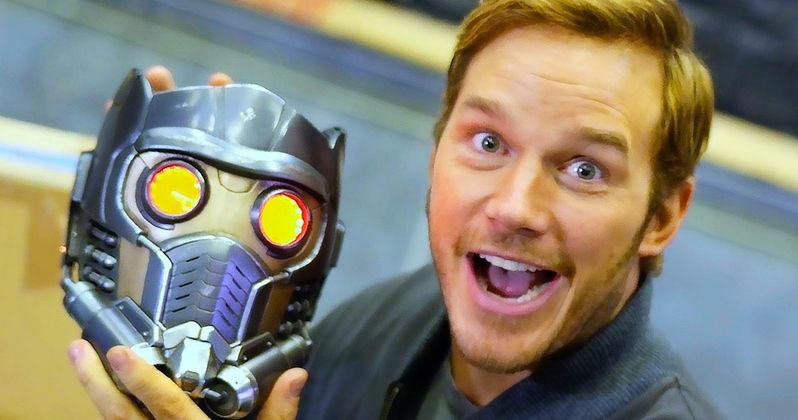 The actor was in such a charitable mood, he even tried to reveal one of the movie's biggest secrets, the identity of Star-Lord's father, before he was interrupted by writer-director James Gunn. The video gives us a glimpse at the Milano as well, while explaining that just a $10 donation to a worth cause, the Lake Stevens Boys & Girls Club in Chris Pratt's hometown, can enter you for a chance to win a trip to the set. Every donation gives a fan the chance to win a visit to the set plus the opportunity to become an honorary Guardian and hang out with Chris on the Milano. Not only will a donation get you one step closer to an out-of-this-world experience, funds will go towards the construction of a brand-new Teen Center at Lake Stevens Boys & Girls Club. This center will provide a safe place for teens to build relationships with mentors, get help with homework, develop professional skills and be with friends in a welcoming environment. Here's what Lake Stevens Boys and Girls Club Director Mike Wetmore had to say in a statement. "We're so thankful for the support of Chris and the Omaze team as we work towards our goal of building a Teen Center. We currently offer a variety of resources and programs for kids, and with Chris' involvement in the Omaze campaign, we're looking forward to being able to expand our offerings to provide a safe space for teens as well." The Grand Prize includes a visit to the set of Guardians of the Galaxy Vol. 2, which includes a flight to Atlanta and accommodations in a 4-star hotel. The winner will get to meet and have lunch with Chris Pratt, and get a behind-the-scenes tour of the set and the Milano. To learn more about the campaign, The Lake Stevens Boys & Girls Club and to enter for your chance to win, visit Omaze.com/Chris. The campaign closes on May 3, 2016 at 11:59:59 p.m. Pacific Standard Time ("PST"). Check out the video below, and stay tuned for more from the Guardians of the Galaxy Vol. 2 set.